Lake Region Electric Cooperative has seen the light: the LED model chosen to replace its 70-W high-pressure sodium and 175-W mercury vapor security lights. The decision came after head-to-head tests of products from seven vendors. 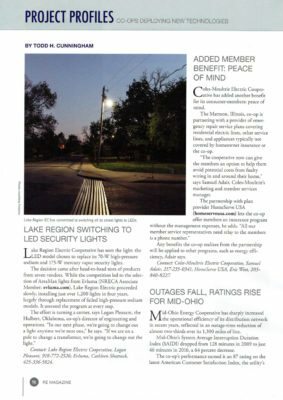 While the competition led to the selection of AreaMax lights from Evluma (NRECA Associate Member; evluma.com), Lake Region Electric proceeded slowly, installing just over 1,200 lights in four years, largely through replacement of failed high-pressure sodium models. It assessed the program at every step.